Several messages displaying pictures of young men and claiming they are child traffickers have been doing the rounds in Bengaluru too. On Wednesday, a 65-year-old woman was lynched in Tamil Nadu’s Tiruvannamalai. Her family too was brutally attacked, as the angry mob thought they were child traffickers. The fake messages about 200 child traffickers entering Tamil Nadu has already cost two lives. While Rukmini was killed in Tiruvannamalai, another man named Ganesh* was killed in TN’s Thiruvallur. 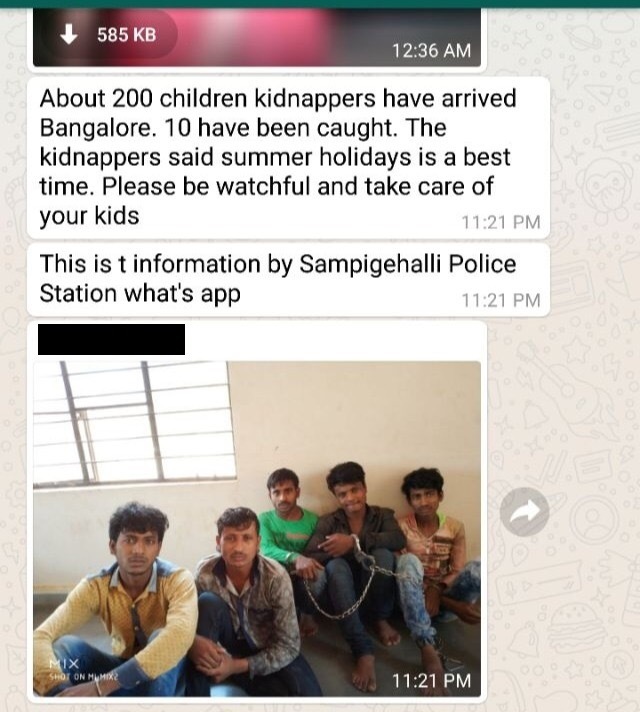 The fake news has spread to Bengaluru too, with messages doing the rounds claiming that Sampigehalli police have sent out warning about child kidnappers. A CCTV footage of a little boy being snatched away by two motorists has been doing the rounds in TN, ‘alerting’ people about how kidnappers are operating in the city. The video incidentally is not from India, but was an educational video made in Karachi. The video which is at least a year old was made in Pakistan to warn parents about child traffickers. In fact, the full video shows the motorists returning with the child and holding a placard which read, "It takes only a moment to kidnap a child from the streets of Karachi. Every year, over 3000 children go missing in Karachi, Pakistan. Keep an eye on your child." Though the original video is a 58 second one created by Roshni helpline to educate parents about unsupervised children, the video doing the rounds in TN and Bengaluru is edited to 28 seconds. In 2017, Boom live published a story about the same video that had been doing the rounds in India. WhatsApp rumours about child trafficking further spread terror among people, resulting in 7 people being lynched in Jharkhand in May. This is the video going viral in Tamil Nadu. An audio clip, reportedly by a man in Vellore, warning listeners about hundreds of child traffickers entering the state was widely shared on WhatsApp. The clip specifically mentions that the kidnappers are 'Hindi speaking' people, provoking villagers further. According to Thanthi TV, a 29 year-old man from Cheyyar was arrested for recording and forwarding this audio clip on WhatsApp, fanning paranoia. Veeraraghavan, a mason. reportedly sent many such forwards over the past week, asking parents to keep their children safe. He had forwarded lengthy videos that had reportedly said 20 children had been kidnapped by 'north Indians'. The accused has allegedly forwarded such messages for ‘fun and publicity’. WhatsApp forwards, tweets and Facebook statuses with the pictures of men and women under police custody have also been doing the rounds in Tamil Nadu and Karnataka. These messages also claim that the information has been issued by a city police station. A Google reverse image search did not reveal the source of the pictures, but the Bengaluru police clarified that that the news and pictures were fake. A message targeting the people of Kancheepuram also said, "Don't allow your children to leave the house alone. Till today, 52 children have been abducted in the district. There are complaints in every police station." Reacting to the Kancheepuram SP Santosh Hadimani said, "These fake messages have led to unprecedented attacks across districts on anyone the public deems suspicious. Two days ago, in Kancheepuram, a local auto driver was mistaken for a Hindi speaker trying to abduct children and assaulted." He also added that the numbers have been fudged in these messages and that the cases of missing children are not as many as is being spread.